In my closing keynote at Mix-It 2012, I talked about why I think everyone should learn programming as a basic skill and then about the various non-traditional ways that programming can be learned, both online and in person. I personally prefer the approach of learning to code in person, around humans that can be there to explain why things work (or don't work), but not everyone has the opportunity to learn in person — so it's great that there are people out there experimenting with online education. While researching the talk, I was surprised to find that there are a lot of ways to learn to code online, many of which I wasn't familiar with, so I thought I'd take a minute to list them here. If you've tried any of these or know anyone who has, let me know in the comments how it was. Many top-tier universities are now making their curriculum available for free online, like their videos and sometimes homework and lecture notes. You won't earn an actual degree from watching them, but you will benefit from seeing how some of the smartest professors explain computer science concepts. MIT: The entire university has an OpenCourseWare initiative to put as much as their lectures online as they can, and that includes about 244 courses from the department of Computer Science and engineering. Stanford: They are experimenting with the concept of virtual students for some of their classes (including some non-CS ones), where you can sign up for free, watch the lectures as they happen and actually do the homework. Coursera: A site started by Stanford professors, it is aggregating together a few top-tier universities following in Stanford's steps and encouraging more to join. Udacity: A similar site to Coursera (and also started by Stanford professors!). Many folks have realized that you can teach programming without being a university professor and are building platforms and tools to teach online and/or to encourage people to teach eachother. Udacity: A set of nanodegrees to teach you modern skills in particular career areas, like frontend or mobile. Often taught by industry professionals, and includes code reviews from alums. Khan Academy: A non-profit that wants to make education freely available, they have interactive courses on JS, HTML, and SQL. CodeSchool: A site with interactive tutorials and videos, ranging from newbie (like the famous TryRuby from Why-the-lucky-stuff) to more advanced. Udemy: A platform for letting anyone create a course (with a set of video lectures) and then charge for people to watch it (usually around $30). 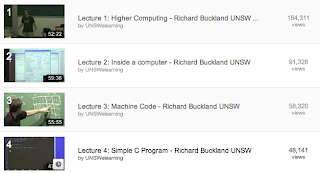 It's not programming-specific, but there are a few beginner-level courses up on it. Bloc: An online, paid custom tailored curriculum for learning design, web development (ruby), and iOS, including personal mentorship and interaction with other students. Team Treehouse: This startup teaches web design, web development, and iOS development through videos and quizzes. CodeAvengers: Play a game and learn JS at the same time. 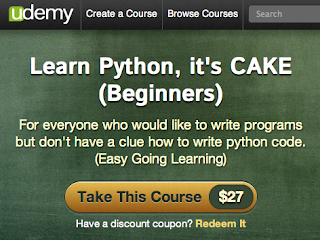 iHeartPy: An online lesson in Python, with badges. SkillCrush: A just-launched startup with tutorials on practical web development topics (including not as technical topics like "Beautify your blog") and a daily newsletter with terms of the day. And of course, there are also sites that attempt to aggregate many of the above sources, so that you don't have to visit them all: CourseBacon and Teach Yourself To Code. If you try one of these out and get frustrated, don't give up - take a break, try again, ask a friend, or try something else. Programming is hard to learn, and even harder if you're going about it on your own. Good on you for taking it on, either way!